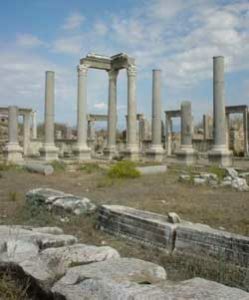 Perge is one of the most important ancient city of the world was situated is 18 km east of Antalya Province. The Hittites had settlements in this area around 1500 B.C., and St. Paul stopped here on one of his journey during the time when Perge was an important city of ancient Pamphylia. The stage of the theatre has very nice marble relief work. On the outer wall is a three sectioned memorial fountain. Some of the reliefs from the city are displayed in the stadium for easy viewing. Other ruins worth mentioning are the handsome city gate flanked by two lofty towers, a long colonnaded street that was once lined with shops and mosaic pavements, a large agora, and buildings that used to house the baths and gymnasium.